Gov. Asa Hutchinson said Thursday (Jan. 10) he will kick-off the 2019 legislative session next week by asking state lawmakers to quickly approve his government transformation plan, one of the four cornerstone agenda items that are part of his $5.75 billion budget request for the 92nd General Assembly. In a one-on-one interview with Talk Business & Politics at his State Capitol office, Hutchinson said he wants to start with a gaggle of key bills to streamline state government to set the tone for the rest of the session that begins on Monday, Jan. 14. He said the threshold necessary for several bills that will funnel through the House and Senate to downsize 42 commissions, boards and agencies into 15 cabinet-level departments will be a challenging task. Concerning the transformation plan, State Rep. Andy Davis, R-Little Rock, and Sen. Bart Hester, R-Cave Springs, have already filed several bills outlining the governor’s intentions first announced in October. For example, HB 1070 was filed in late December as the overarching measure that establishes the new cabinet-level departments and transfers various state government entities to new silos. HB 1071 outlines the specific duties for the newly created Secretary of Veteran Affairs. HB 1072 outlines the responsibilities of the Secretary of Health under the reorganized plan. The new law reorganizing state government, if approved, would go into effect on July 1, 2019. Davis and Hester also filed several other House bills earlier this week that offer more detail of Hutchinson’s transformation plans, including the creation of a new Department of Commerce to house the Arkansas Development Finance Authority, state Economic Development Commission, the Department of Workforce Services, and the Arkansas State Bank and Insurance Departments. When Hutchinson first announced the government downsizing plan in the fall, he said the massive effort to reorganize state government for the first time in five decades would be historic if eventually approved by the legislature. The three-month head start on the plan was put forward in order to give state lawmakers, government officials, employees and policymakers time to digest the details and offer feedback before the 92nd General Assembly gets underway, he said. Davis, current chair of the House Rules Committee, will be charged with getting Hutchinson’s transformation legislative package through the House. Speaker of the House Rep. Matthew Shepherd, R-El Dorado, is expected to announce committee and leadership assignments in the lower chamber once the assembly convenes on Monday. 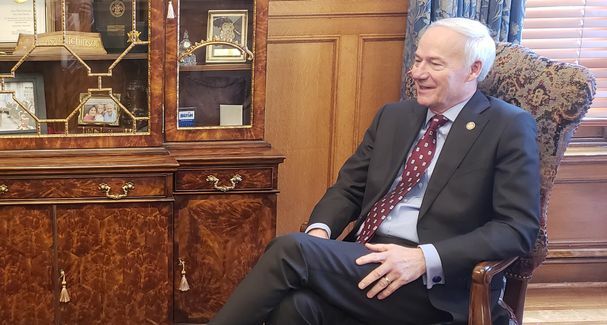 Like his first term in 2015 when he was first elected as Arkansas’ 46th governor, Hutchinson said he has a mandate from Arkansas voters to move the state forward in all areas. Entering his third regular legislative session in his tenure as governor, Hutchinson said his agenda going into 2019 will be more aggressive and precedent-setting than his previous plans in 2015 and 2017. Instead of one or two key mandates, Hutchinson said his legislative schedule for this session had four “cornerstone” issues with the transformation plan, a $110 million tax cut package, teacher raises, along with finding a way to pay for state highway construction. “Whenever you look at historic changes in state government in transformation, when you look at historic changes and patterns in tax rates in Arkansas, when you look at historic rates in teacher pay and then building a new model for highway funding, any one of those items would have been cornerstone as a single items for a legislative session and we’ve got four items,” continued Hutchinson. A long list of activities tied to Hutchinson’s November re-election to a second term will begin on Monday evening with an inaugural party at the Museum of Discovery in Little Rock and end the next night with a black-tie affair at the Statehouse Convention Center. The two-day inaugural celebration will center around the theme “Together for Success” and will include several free and paid events and activities. Hutchinson will give his inaugural address on the State Capitol steps at noon on Tuesday. He defeated Democratic challenger Jared Henderson and Libertarian Mark West in November with 65% of the vote.